With this view in mind, a number of experts met at the III Encounter organized by CUMPLEN, the association of compliance professionals, held recently in Madrid. The purpose of the gathering was to address, from different viewpoints, the major challenges currently facing compliance officers at companies. 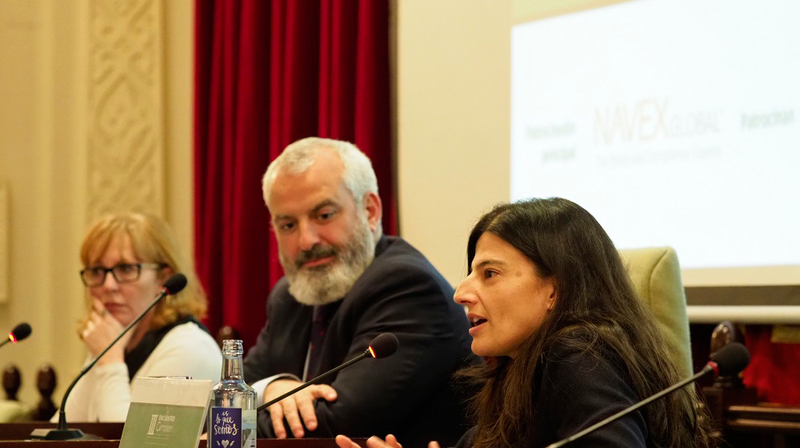 Several Garrigues professionals participated in the two-day event, which paused to honor the former chief public prosecutor José Manuel Maza, who passed away last November. These professionals spoke of the different challenges facing compliance officers from the criminal law, tax law and labor and employment standpoints. Helena Prieto, a public prosecutor on leave and currently a partner in the Criminal Law practice area at Garrigues, emphasized that following the reform of the Criminal Code through Organic Law 1/2015, the compliance officer, as head of the crime prevention model, has become a chief figure in the daily work of companies. In her speech, she noted that the risk to which compliance officers are exposed and the criminal liability consequences companies could face from improper performance of this function are giving rise to an intense debate on how to best structure and manage regulatory compliance. José Vicente Iglesias, partner in Garrigues’ Tax Law Department, put forth the standpoint of tax law. The tax compliance round table on which he sat addressed a broad range of topics, such as cooperative compliance, corporate tax liability, good governance and fiscal supervision, which taken together seem to be slowly but inescapably heading toward a new tax scenario. The round table looked at how more traditional concepts, such as tax planning and the role of tax advisors, will fare in this new scenario. At the opposite end of the spectrum, the table also addressed new developments such as compliance programs, good governance rules and potential future good governance certifications, as well as the possible forward-looking changes the tax authorities may unveil. In terms of labor and employment, Ignacio Esteban, principal associate in Garrigues’ Labor and Employment Law practice, participated in a round table discussion highlighting the data-supported gender inequality in the workplace and the need to address these realities. This includes access to jobs, the part-time and temporary job rates, professional promotions, and more. The discussion focused on the need to strike a greater work/life balance and shared responsibility, the presence of women in executive positions and governing bodies of companies, and the gender pay gap. Throughout the two-day III CUMPLEN Encounter, the participants discussed the current best compliance practices and shared real-life experiences from their respective companies.